Did you know that the wonder fruit avocado is a climacteric fruit? These fruits grow to maturity on the tree but will ripen only after they have been harvested. It is as if the tree preserves them until you are ready to use them. Avocado (Persea Americana) also known as alligator pear or butter fruit and aligatapera in Sinhala and venney in Tamil is a single-seeded berry belonging to the family Lauraceae. In Sri Lanka, the major growing areas are Kandy, Matale, Nuwara Eliya, Badullla and Kegalle, generally with two to three trees in home gardens. The trees take five to seven years to bear fruit and can produce between 150 to 500 fruits a year. Avocados can look like darkish green pears, or can be round or elliptical in shape.The skin is smooth to rough, with the colour varying from greenish yellow to reddish purple or black. The flesh is greenish yellow when ripe and buttery in consistency with a delicate nutty taste. The fruit has one large seed about 10 to 25% of its weight.The green fruit can take two to seven days to ripen at room temperature. Avocados are ethylene sensitive, so you can speed the ripening process by placing the fruit in a paper bag with an apple or banana. To check for ripeness, gently squeeze the fruit in the palm of your hand, when they yield to gentle pressure, they are ready to eat. Always avoid using fingertips to check for softness as avocados are extremely sensitive and bruise easily. The fruits are also highly perishable. Avocados can be eaten in the soft or firm stage. The ripe fruit blended with condensed milk and vanilla or dribbled with treacle or some grated jaggery is delicious. The smashed fruit makes a great guacamole or dip, can even be spread on your toast or sandwich and is also a healthy alternate to mayonnaise in a chicken or egg salad. The void in the fruit when the seed is taken out is a natural bowl for any type of salad. This can also act as a perfect ‘bed’ for baked eggs. If you have never tasted a baked avocado, you are in for a treat. The silky, smooth texture will blow you away! The ripe fruit is also used in drinks, smoothies and starters and is a creamy addition to soups. The soft, creamy texture and its mild taste make it a perfect first food for babies. Firmer avocados can be sliced and used in salads, sandwiches or salsas, or as a topping for your morning egg or just eat it with some salt and pepper. Avocado contains more than 20 essential vitamins, minerals and phytonutrients, has the highest protein content of any fruit and is loaded with dietary fibre. An average sized avocado has about 300 calories of which about 70 to 90% is from polyunsaturated and monounsaturated beneficial fats. The fruit is also a good source of B complex vitamins that play an important role in keeping our bodies running like well-oiled machines, vitamins C, E and K, provitamin A carotenoids, potassium and folate. 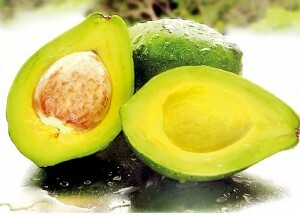 Thanks to the fat content in avocado you can get good absorption of the carotenoids and vitamin A even from other food. Avocado is an excellent source of monounsaturated fatty acids such as oleic acid which is also the major component in olive oil as well as omega-6 poly-unsaturated fatty acid linoleic acid. These fatty acids lower dangerous LDL cholesterol and increase beneficial HDL cholesterol. The high level of vitamin E in the fruit helps prevent cholesterol oxidation while vitamin K aids blood coagulation. The high potassium content in the fruit regulates heart rate and blood pressure. The oleic acid and dietary fibre helps normalize blood sugar levels providing further benefits for heart health and lowering risk of diabetes. Avocado contains the carotenoids lutein and zeaxanthin that filter harmful high-energy blue wavelengths of light and act as antioxidants in the eye. This helps protect and maintain healthy cells and also helps reduce the risk of age-related macular degeneration. You will be surprised that a fruit such as avocado is good for weight loss. This is because the monounsaturated fatty acids are used as slow burning energy. This steady energy and the feeling of satisfied fullness reduce hunger and appetite. Half an avocado provides approximately 25% of the daily recommended intake for vitamin K, a nutrient that is often overshadowed by calcium and vitamin D for maintaining bone health. Vitamin K supports bone health by increasing calcium absorption and reducing urinary excretion of calcium. Avocado is particularly important for women who are pregnant due to its high concentration of folic acid. Folate is extremely important for a healthy pregnancy, with adequate intake reducing the risk of miscarriage and neural tube defects. The high content of vitamin K in the fruit helps avert vitamin K deficiency related bleeding in newborn babies. The high fibre in the fruit promotes regular bowel movements and maintains a healthy digestive tract and also lowers the risk of colon cancer. Avocado is a serious super food when it comes to depression as it contains high amounts of folate that helps prevent the build-up of homocysteine, a substance that can impair circulation and delivery of nutrients to the brain. Avocado is one of the most inexpensive anti-aging tools. The monounsaturated fat improves skin tone and controls acne and blackheads. The antioxidant carotenoids and vitamin E protects your skin from wrinkles and other signs of aging and sun exposure. The vitamin C in the fruit maintains the elasticity and firmness of the skin. These are some amazing avocado benefits for your health and appearance, so it is well worth including more of this awesome fruit in your diet.